The same day that my mom and I went to that historic first garage sale of 2010, but we made it to a couple of estate sales.It is time to disclose the treasures I scored. I am usually not one for board game buying but there is a 1949-1950 edition of Clue, pictured above. 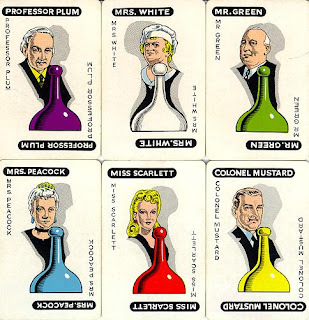 With these old-fashioned character cards. I love those! They are so different from the 1970s-era cards I grew up with. 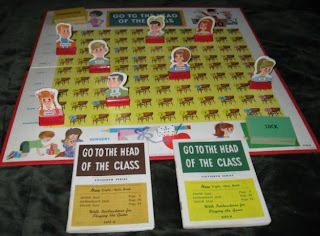 And I paid $2 for an ancient "Go To The Head of the Class." I opened it just thinking I wanted to see the board again. But the game was so beautiful and complete that I ended up buying it. Thank goodness I did! Because the picture up above, I just took it from eBay. And on eBay whoever was selling the game was asking $25. The game comes with these quiz books and we were laughing about how tough the questions were. You had to know things like which steamship crossed the Atlantic in the least amount of time. Perhaps they have questions about Leonard Pennario! We will have to find out. I also scored a gold lame jacket. And a chapel veil. I have been looking around for a chapel veil to wear to church when I do not have a hat. It is in, in the hip Latin Mass that I go to, to wear a veil. I have been surprised to find them so scarce at estate sales. This is the first one I have found. My new chapel veil is black lace, not white lace which is what I thought I wanted. But now I kind of like the black lace look. It will make me feel like a tragic Catholic opera heroine! Like Floria Tosca. 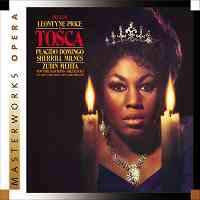 Or Desdemona from "Otello." Pennario liked that opera. I remember he told me how she sings the Hail Mary when she is about to be killed. Me, I will wear my chapel veil in good health. I will go forward with my estate sale finds! Women used to be very fussy with chapel veil colors. SOME would only wear black as widows... and only black. Some work white only after Memorial Day.... and some wore black only after they got married, where as single ladies wore only white. But then I'd be confused if the veil was navy blue. I am always amused how easily human regiment things!! :) You'll look so lovely in a veil, I'm sure.. though I do love your hats!! I've heard that white is for the unmarried and black is for the married. You can buy them new, too. Nice seeing you at Mass today.